Scientific name: Vicia faba. Other names: Faba Bean, Horse Bean, Tic Bean. An ancient legume of the papilionaceae family, it was cultivated in Roman times and is now found in all the continents. Every 100 grams contains carbohydrates (49.8%), proteins (23.1%) and also phosphorus and calcium. The crop is harvested four or five months after sowing. 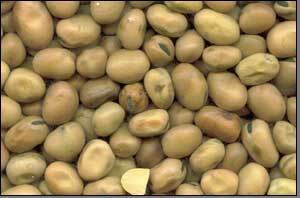 The beans can be used to accompany other foods: as a main dish , in salads, casseroles and soups. Broad Beans are one of the main products here in Egypt it is used for human consumption with huge quantity, and it is Consumed around the year. Beside the local product it is imported from Australia, China, UK, and France. Egyptian Beans are one of the main products here in Egypt it is used for human consumption with huge quantity, and it is Consumed around the year. Faba,Vava,Fiesta Beans are one of the main products here in Egypt it is used for human and animal consumption with huge quantity, and it is Consumed around the year. Beside the local product it is imported from Australia, China, UK, and France. Splited Broad Beans are one of the main products here in Egypt it is used for human consumption with huge quantity, and it is Consumed around the year. I is processed in local milling factories. Faba,Vava Splited Beans are one of the main products here in Egypt it is used for human consumption with huge quantity, and it is Consumed around the year. I is processed in local milling factories.